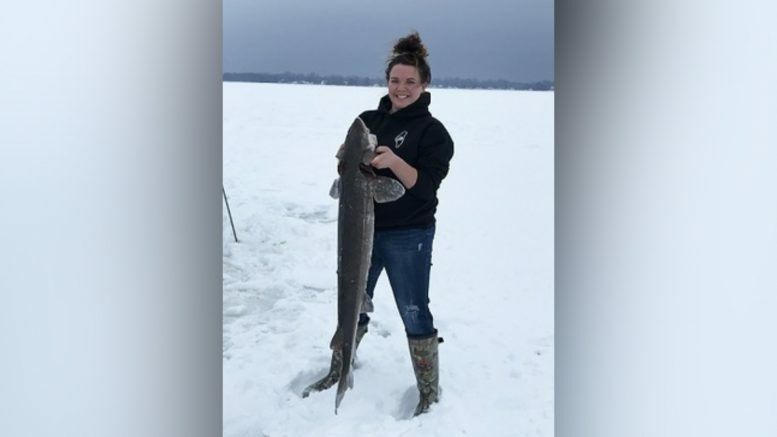 (Photo Courtesy/Michigan DNR) Stephanie Miller, the second successful angler of the 2019 Black Lake sturgeon season, holds the fish she harvested shortly after the season opened. Black Lake, Mich. — This year’s sturgeon season on Black Lake was over in the blink of an eye. Sturgeon fishing was scheduled to take place from February 2 through the 6 or until the harvest quota was reached. Anglers surpassed that quota after 78 minutes of fishing. They used spear and hook and line tactics to haul in fish. Six fish were caught on the Cheboygan County lake. The Michigan Department of Natural Resources set the harvest quota at six fish. 403 registered ice anglers hit the ice this past Saturday. In 2018, 422 were on the ice. Three of the fish captured had been taken before by researchers from Michigan State University and the DNR.